Col d' Orcia is a large domain from about 150ha on the south flank of the Montalcino hill, dating back till the 18th century. The domain is saturated by tradition and gives an honoured place to the Sangiovese (80% of the vineyards). It refuses to do body building with its wines. These are timeless wines, which ripen in large casks (150hl). And of course there is the Brunello di Montalcino, but also the rare Riserva, two wines from a higher level with a long possibility to age. For beautiful fruity wine with a young approchable taste there is the Rosso di Montalcino and also the Banditella as 'single vineyard'. Special wines in the range are Nearco and especially Olmaia, that with its international character, thanks to the 100% Cabernet, very close to the Super Tuscans. The Sant' Antimo Pinot Grigio conquers the heart of every lover of Italian white top wines. Poggio all Vento: a beautiful name for a quite large bottle. 'Poggio all Vento' refers to a part on a hill, maybe because it’s exposed to the wind, but anyhow south directed. It is located on a height of 350m in the municipality Sant' Angelo in Colle, to the south of Montalcino. Exactly like the other Brunello’s of Col d' Orcia, the Poggio all Vento is also elevated in a traditional manner, without too much extraction. 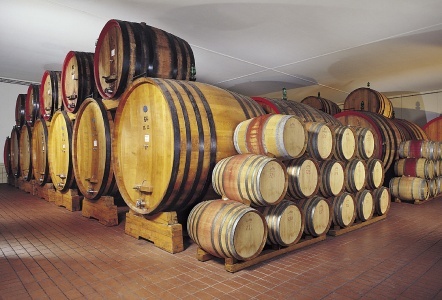 As the Riserva law prescribes, the wine is kept 4 years in large wooden casks. Before the wine leaves the domain leave, this wine ripens yet another 2 years in bottle. Talking about tolerated and outspoken view for quality!! No matter how, this is a school example of Brunello: deep dark red colour with shades of grenade red. Delicate aromas of dried red fruits and smoky flavours. An elegant and fresh aftertaste with a very long final, without only dominance of alcohol, and again hints of dried fruit and tobacco. 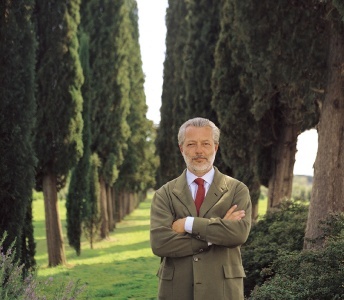 A well-educated Italian wine with evident and natural class! !